What exactly was going on behind-the-scenes still remains something of a mystery, although UNM Athletic Director Paul Krebs has insisted that the process ultimately played out as it was supposed to. Upon Neal’s seven-figure dismissal, Krebs said that UNM could not afford would not be using a coaching search firm this time around; instead, he would do the gold panning, more or less, by himself. But that didn’t mean Krebs was without the aid of outside wisdom, or at least professed wisdom. One such font of advice for the Lobos’ Athletic Director was Dan Dakich, the TV basketball commentator, radio host and belligerent Twitter persona, whose lot in professional life appears to be aimed at propping up Steve Alford, while offending the sensibilities and intelligences of most everyone else. That list includes, but is not limited to: Tom Izzo, Fran McCaffery, much of the state of Iowa, Frank Kaminsky, fellow sports-talk radio hosts, and large pockets of Hoosier Nation. But whereas some find in Dakich a hot mess of bad takes — in 2013, Deadspin anointed his as the 32nd worst Twitter account in all of sports — Krebs apparently finds sage counsel. 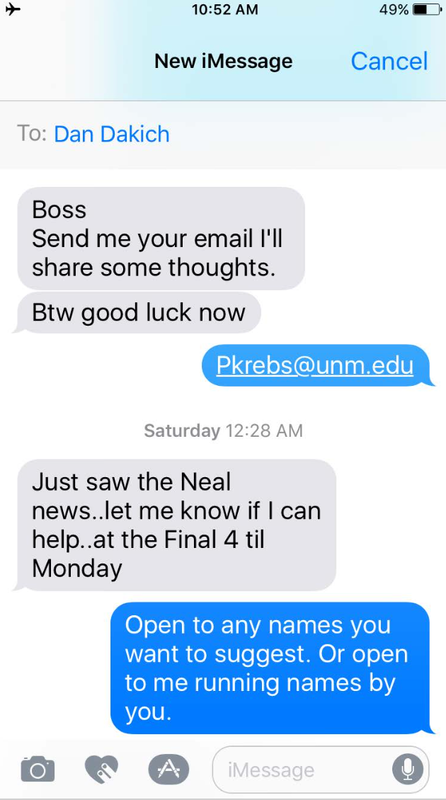 That is made evident in a series of text message exchanges between Krebs and Dakich, in the harrowing days surrounding Neal’s ouster. NMFishbowl.com recently obtained a small (and incomplete) sampling of their dialogue through a public records request. “I might need to start paying u finders fee,” Krebs wrote to Dakich. He later asked Dakich to recommend any names of coaches he should consider for the job. “Boss, Send me your email I’ll share some thoughts,” Dakich wrote to Krebs. (No such email was provided to NMFishbowl.com, although we’ve made additional requests.) For now, we can only imagine the brainstorming session that may have ensued. The duo has had a long and friendly history dating back to Bowling Green, where Dakich was the head men’s basketball coach when Krebs was hired as AD in 1999. Three years later, Dakich accepted the head coaching job at West Virginia, but bailed out after reportedly learning of NCAA violations that were likely coming down the pike. Krebs paved the way for Dakich to return to Bowling Green, where he coached until 2007, when he resigned after multiple losing seasons. Krebs had left the previous year to become AD at UNM. More recently, Dakich was a prime peddler of the Alford-to-Indiana coaching rumors, crowing at one point that the deal was done, which, of course, it was not. Indeed, Dakich’s gut instincts have not always been so finely tuned with reality. According to a mostly-flattering Indianapolis Monthly profile, Dakich joined Kelvin Sampson’s Indiana staff convinced that the serial-cheating former Oklahoma coach would “straighten up” after being given a second chance at IU. Neither Krebs nor Dakich responded to emails asking them to elaborate on who Dakich was shilling for suggested Krebs try to hire. In response, Hopkins' lawyer threatens a federal lawsuit against UNM. This could get ugly.